There were many ways to earn credits during Winter Session 2019. 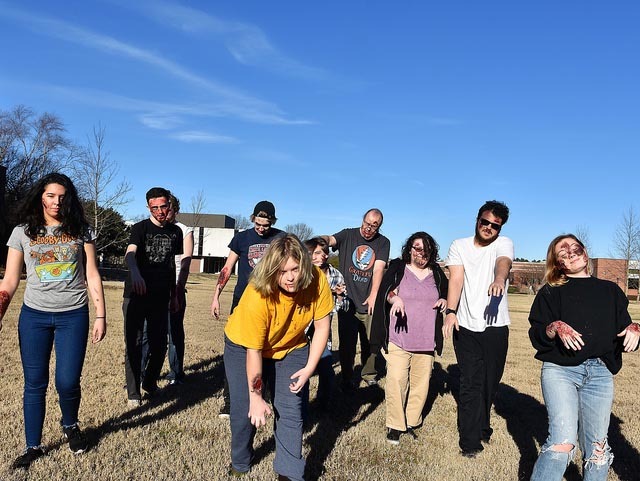 For 37 students (34 of them freshmen) enrolled in the four-credit course “Science of Zombies,” studying topics such as death and decomposition, forensic entomology, and pathogens, viruses and parasites, was their avenue of choice. The contemporary topic was just the draw that biology professors Vic Townsend and Deirdre Gonsalves-Jackson had in mind when they developed the new course. Capitalizing on the popularity and cultural obsession with the undead, they created a Winter Session course chalk full of scientific concepts all depicted through this king of current horror genres. 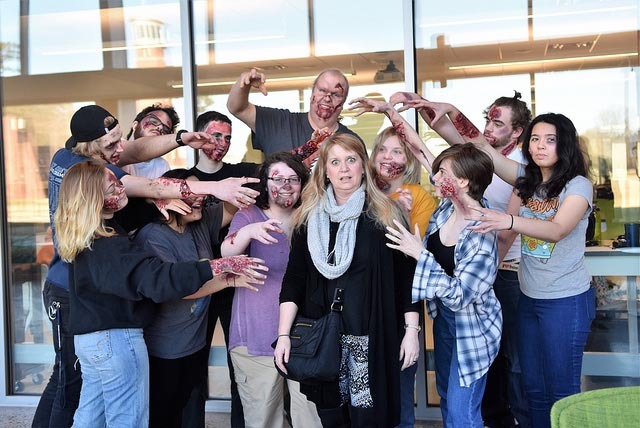 Their non-traditional approach certainly resonated with the students who met for class for two to three hours each day during the January term to engage in interactive lectures, class discussions, group projects and an analysis of 10 zombie films. In addition, students heard from guest lecturers from the campus and the community on topics like embalming and mortuary science, psychology, literature and ecology. They even maintained a zombie diary, wrote an original zombie story and participated in a zombie makeup demonstration. Townsend noted that the students also studied the biology of behavior-altering parasites (“real zombies”), the characteristics of life and basic concepts of homeostasis and essential functions of the organ systems of the human body as they relate to brain function, locomotion, digestion, respiration and circulation. For the first time, Winter Session was mandatory for freshmen like Vanden Berg, who is a Batten Honors College student double majoring in art and biology. She described the course as very fast-paced and jam-packed with so much information that it was “overwhelming at times.” She says that she enjoyed the course immensely and learned so much. She especially enjoyed the zombie films on Tuesdays and Thursdays and learning about the science of decomposition and parasites that cause animals to display zombie-like behavior. “This course provided a strong foundation for learning the basics of biology and it was taught through a fun means so it was always engaging,” Vanden Berg reflected. “It provided a lot of new information for my brain to chew on. I'll probably be thinking about the material I learned for a long time." VWU's Winter Session provides a unique opportunity for students, including first year students, to engage intensely in interesting areas of study both in and outside of the classroom. Learn more about Winter Session at VWU and View the 2019 Winter Session Photo Gallery.